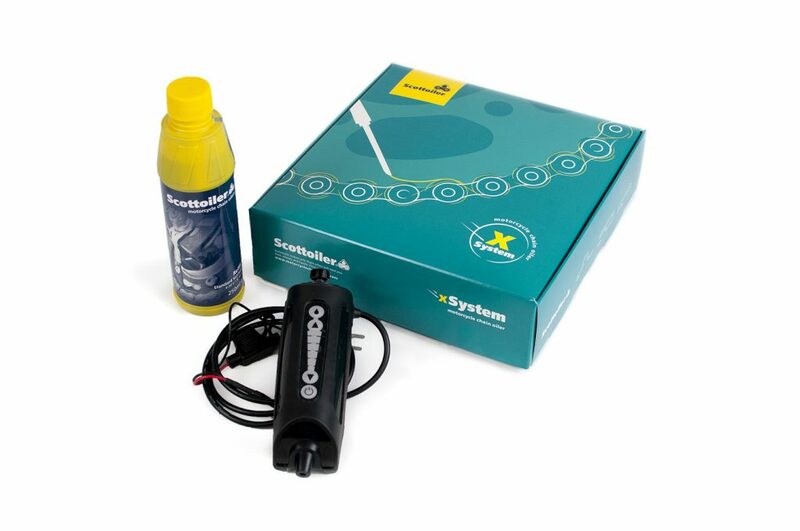 Motorcycle chain lubrication specialists Scottoiler are to launch a new electronic chain oiling system – the xSystem. The highly anticipated new product will be officially released through Scottoiler’s global distribution network from Monday 30th April. The xSystem is Scottoiler’s easiest to install and most user friendly system to date. It features a revolutionary new design that offers user friendly features, such as one touch adjustment, in a compact package that provides optimal chain lubrication for all riding conditions. “We are very excited to be bringing another new product to the market. The xSystem is a new electronic chain oiler that perfectly fills the gap between our flagship mechanically operated vSystem and our premium eSystem. The xSystem provides customers with another option for how to deal with chain maintenance that is without doubt our best fit and forget solution yet. Initial orders through our distribution network have been very encouraging and it is an exciting time for everyone at Scottoiler”. The xSystem uses a micro-processor and triple axis accelerometer to ensure your chain is lubricated automatically with minimal rider input. Installation and setup are simple too, something which will appeal to both dealers and home mechanics alike. One key feature of the xSystem is the new dispenser design. It uses high quality super-adhesive 3M tape that sticks to all surfaces and provides an easy and effective solution for mounting the dispenser. The new dispenser parts reduce the risk of incorrect installation and the need to use any unsightly cable ties around the swingarm. Compatible with most types of swingarms, left or right transmission systems and even single sided swingarms the new dispenser makes the xSystem installation easy, reliable and discreet. The xSystem offers 5 different flow rate settings that approximate to 20, 50, 80, 120 and 150 seconds between each pump activation so it can be easily adjusted at the push of a button to provide optimal lubrication whatever the riding conditions. It also has the ability to be switched off when not in use for extended periods or when the bikes goes in for a service. Your settings are stored in the xSystems memory so when reactivated it will continue to maintain your chain to your preference on your next ride. The xSystem really is so simple to use. Once installed you can easily adjust the flow rate, if conditions deem it necessary, and refilling when needed is straight forward. In turn it will eliminate the hassle of cleaning and lubricating your chain manually, with the low-tack Scottoil making it so much easier to keep your transmission clean. Ultimately the xSystem will significantly extending your chain and sprocket life, saving you money on costly replacements. For over 30 years Scottoiler have been the market leaders in automatic chain lubrication. With a global distribution network spanning over 30 countries, Scottoiler are renowned worldwide as the benchmark for motorcycle chain maintenance. The launch of the xSystem is the culmination of an extensive research and development project from the Scottish company as they continue to bring chain lubrication to more and more motorcyclists around the world, having just this year surpassed half a million customers worldwide. The Scottoiler story began with a great idea. In the late 1970s, our founder (and dedicated biker) Fraser Scott turned his idea into reality with the invention of an automatic chain oiler. Without enough money in the early days to market the product properly, he was able to grow the business by word of mouth, building sales as satisfied customers spread the news to friends and local dealers about the benefits of a Scottoiler. More than 30 years on, we export our high quality products to over 30 markets worldwide and have partnerships in place with world class companies like BMW. We’re still a family-run business, one which is highly regarded throughout the global motorcycle industry. Our in-house R&D team at our Glasgow headquarters continue to innovate combining quality and reliability with our brand values of passion, precision and progress to create market leading products. Sourcing locally where possible we’re proud to take a sustainable and ethical approach to all our operations. As we continue our journey we maintain our focus on producing excellent products which deliver the highest levels of satisfaction for our customers.